Build the credit your business deserves. Report your business phone, internet and utility bills to build business credit. With eCredable, you can link up to 8 eligible account types such as power, water, gas, mobile phone, cable TV, satellite TV, internet, and landline phone to your eCredable Credit Profile. You focus on your business – we’ll focus on building your business credit file. 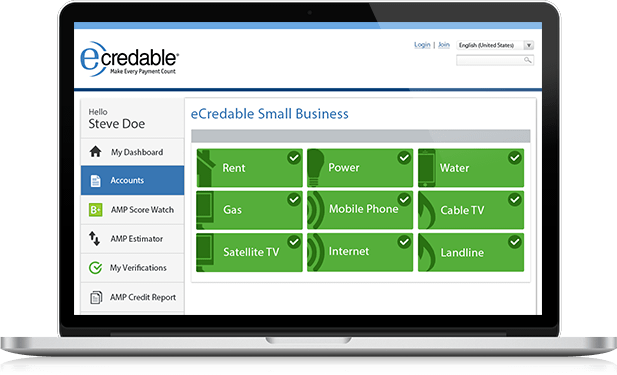 eCredable automatically reports your prior payment history and ongoing monthly payments for your business utility and telcom accounts to business credit bureaus that maintain your business credit reports and scores. After you link your business utility and telecom accounts to your eCredable Small Business Credit Profile, we can securely download up to 24 months of payment history directly from your provider’s website. Then automatically update your payments on a monthly basis. Access credit or loans as your business grows. Your business's credit score helps lenders, suppliers, and other creditors quickly evaluate whether the business will pay its bills on time. Once you are sure that you have a business credit score, get the funding and good credit terms you need to grow your small business.